The Horror Digest: Blood Simple: That's Funny...I'm Afraid of the Underside of Sinks Too! 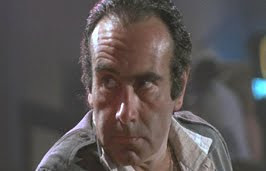 Blood Simple: That's Funny...I'm Afraid of the Underside of Sinks Too! It took me about 3 days to watch Blood Simple. I'd like to tell you it was because I was hopelessly tired after working X amount of hours at my 2nd job--but unfortunately the truth of it all is, the movie just did not grab my attention. But isn't that the way most Coen brothers films are? We find ourselves submerged into this story that feels like it's kind of going nowhere fast until, we are blessed with that sudden moment of realization. Sometimes it takes until the very last scene, and other times it's something as simple as realizing that the score is one of the most intelligent things that has ever happened throughout your movie watching career. It's the kind of subtlety we yearn for in the days of 3-D graphics and another tiring attempt from Tim Burton at imagination. It's pure, unadulterated, good old fashioned story telling--the kind of movie that doesn't spell out for you what it's all suppose to mean. It just is what it is. Simple. But then again maybe not so simple after all. While I don't necessarily agree with Bravo that the film deserves a spot on the 100 Scariest Movie Moments list--I can agree with a pretty well respected notion of the film just being great. The very first film of the Coen brothers is nearly perfect in what it delivers to it's audience and how it delivers it. Scary? Not at all. But curious and fantastic, yes! Our plot centers around Julian Marty who suspects his wife is having an affair with his bar manager. After hiring a private detective, and finding out the truth, Marty decides his wife and bar manager must be killed and his P.I. to do the dirty work. What follows is a relatively simple plan that goes astray- and the simple misconceptions that suddenly turn things complicated. It's funny- I had to keep on checking the Netflix description of the movie because I felt like I was constantly missing out on something important. I wasn't though- the movie really is that basic. Man wants wife and lover dead. Bam. But that basic notion that simple plans don't always turn out to be so simple, is alive and thriving. In fact, there are several levels of misunderstanding that you don't entirely realize until the films conclusion. And THAT is what I wholeheartedly enjoyed about this film. Since we are never really inside the mind of any one character, it becomes nearly impossible to know what it is they are thinking. Ray and Abby both have different ideas about what happened- and heck, so does the other bar manager and the woman's voice(Holly Hunter) on his answering machine- AND Marty. Everyone is under a false impression of the truth--even Visser who doesn't realize his lighter is still underneath that rotting fish. It's truly an interesting thing to think about. Even that last line of Abby's, really makes you almost smack your head in wonder- "is that really what she thought this whole time?!" aka Tully from The Addams Family who holds the record for the number of sleaze bag roles he's played. Marty is every bit as sleazy and creepy as they come and his permanent five o'clock shadow will never stop making me uncomfortable. These characters are so simplistic though- on the outside and on the inside. You get the feeling halfway through that these people don't do a lot of thinking in their spare time--once again--simplicity! BUT also once again, these simple folk actually end up making things more complicated because of their simple thinking patterns...is this making sense? I really can't properly express how much I actually enjoyed this film once I began to realize just what it was that was happening. The scene that Bravo chooses to highlight is squirm worthy sure, but I found so many other moments that actually portrayed some genuine creepiness. Frances McDormand's nightmare for one, was insanely creepy, and the clunking noise of cowboy boots is something that I may never be fully able to erase from my head. Also the scene in the back of the car- and the burial....yes I'm being vague here but for good reason. Something that is really bothering me however- is how the people are talking about the film on Bravo. Were they even watching the same movie that I was? It is nothing like they are making it out to be, and that really makes me angry. No one ever claims to be dead in this movie--no one is "Rasputin". Ugh. I'm rolling my eyes over here. 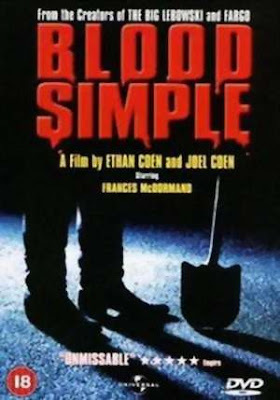 Blood Simple is just genius and that's all you really need to know. The last shot in particular is enough for you to understand that what you just watched, is an hour and 36 minutes of the most subtle form of intelligence possible. Also I must say, I am in love with the score in this movie. It only further goes along with the idea of something simple- turning out not to be so simple. It's absolutely brilliant. I saw this movie back in the day (when they kept switching the songs on the jukebox, first time I saw it they used "Same old Song" the second time I saw it, they used "I'm a Believer"). What got me about Blood Simple was the reality (cleaning up blood with a nylon jacket - how hard it really is to kill someone etc...). All in all a great modern Film Noir, but NOT a horror film. I haven't seen this one yet, I'll have to keep in it mind. I dug the flick, it's slow moving but very well made, i love the Coens. I didn't really care for this movie. I just don't really get the Coen brothers for the most part. Not my thing. You're right about the Bravo thing. WTF? Makes zero sense why this is on the list and the way they are talking about the film...geez, it's like they haven't ever seen a horror film before. I'll show you moral depravity!!! Being a die hard fan of the Coen brothers (it's incredibly hard to be manly and rugged when Intolerable Cruelty is in your top 5 movie picks, by the way), when I watched this I was pretty disappointed. It was boooooooooring with a capital "Slow." It actually took the better part of a day to finish it because I kept falling asleep/taking breaks and had to backtrack a little bit to catch it all. Having read this review, however, I think I'll have to go back and re-watch it.